Use this Cycleops Thru-Axle Adapter to mount 142 x 12 mm frames into Cycleops' Classic and Pro Series Trainers. It takes the place of the bike's normal thru-axle and allows a standard quick-release to be used to clamp the bike into the trainer. Threaded on both sides to work with Syntace and Maxle/ABP style thru-axles. 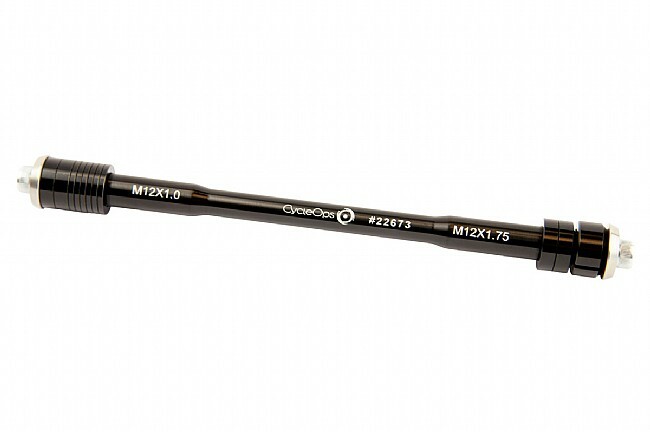 Compatible with most 142 mm thru-axle frames with 1.0 and 1.75 mm thread pitch. Visit the Cycleops website for further compatibility details. Once you get it figured out it works perfectly. Works great on my Trek Emonda SL 6 Disc. I leave it on all the time. Make sure you carry the two required hex keys needed to remove it if you decide to do the same - unless you are crazy like me and don't carry any tools or tubetire repair stuff. I do run tubeless with sealant but yes I know I will likely end up walking home one of these days. It feels like this should cost about $20-25 instead of $40-50, but it is necessary. This worked to use my thru-axle mountain bike on my cycleops magnus trainer, but it wasn't obvious which end pieces should be used to make it fit. If you can't lock the trainer on the widest position, you're not using the right pieces.